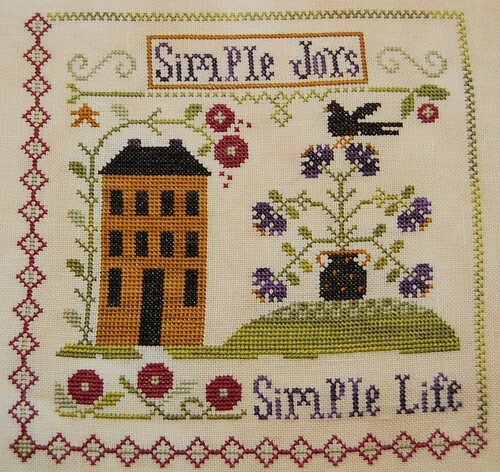 Nicole's Needlework: Simple Joys Finished! 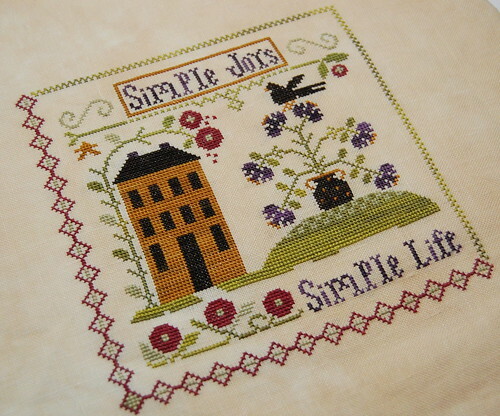 I got "Simple Joys" finished up today. It was such a fun stitch. I needed a smaller project to feel some sort of accomplishment. I have had so many big starts this year that I've barely finished anything! 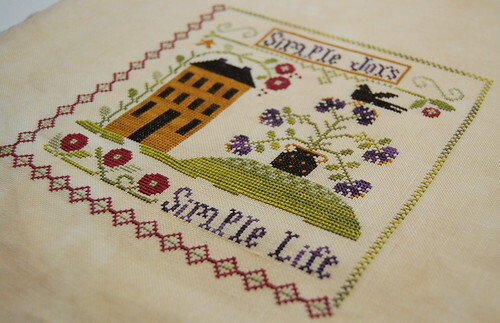 Little House Needleworks "Simple Joys"
Now I'm going to get started on my Prairie Schooler Round Robin. I hope to be finished with them all next week! So pretty! I love your finish! I know what you mean about needing small finishes in between the large projects. I love it!!!!! That is way too cute! That is such a pretty stitch! Your pictures always make me want to stitch. Sometimes it seems all those huge projects will never be finished and finishing a small one gives new energy. Beautful finish! I'm tempted to buy this one! Ha Ha Ha....you laugh but you are probably more correct than you think! Love your Simple Joys! Hope you have a cool weekend. What a beautiful piece! Congratulations! Love your Simple Joys Nicole. And I have to agree that while I stitch on large pieces, I always seem to finish one or two small pieces along the way. Have a great week!! So cute Nicole! I always love a quick stitch! Enjoy what ever you pick up next! Great finish! The colors are so nice. I ordered the chart yesterday so I can stitch it, too! So Cute ! I am with you on the big starts, I need to pick them back up and try to get them completed. Very sweet... congrats on your finish Nicole. Beautiful Finish Nicole! I know what you mean needing a quick finish! Happy Anniversary to you and Chris and I hope you have many many more wonderful years together!! Great finish, Nicole! Love that fabric too. Normally these designs don't appeal to me. But when I see them on your blog they are lovely. Much prettier than the pattern pictures. Love your new finish, and I miss you lots. Coming down soon? I'm off for DDs for a short time. I love this one Nicole and yours is beautiful! Great finish! Always a nice feeling to see one completed. How pretty, Nicole! I was really fading on LHN designs. I thought they were all looking too much alike, but I'm kind of liking this new design direction that they're taking. Thanks for sharing this great finish with us. What a sweet finish, Nicole! I love the colors in it. YGG! Beautiful finish! I love the colors in this one. It is nice to have some smaller finishes to give you that sense of accomplishment in between the bigger ones! I love it!!! How cute is that?? Oh he(it) is absolutely magnificent this picture(board) bravo to you! Such a sweet design, Nicole. Very pretty! Oh I really love this one! Great job and totally agree - we need some finishes to keep us going on those BAP's! Congrats Nicole! Love this design. What a great finish!